Entering Durban in 1973. Taken by John Trotter (Radio Operator). Tonnages: 14,508 gross 9,632 net 23,680 deadweight. 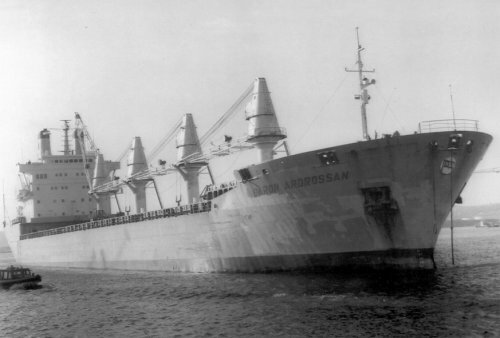 October 1970: Completed by Haugesund Mekaniske Verksted, Haugesund (Yard No. 37) for H. Hogarth & Sons Ltd., Glasgow. Scottish Ship Management Ltd., Glasgow, managers. December 1973: Re-engined by Amsterdamsche Droogdok Maatschappij, Amsterdam with two Stork Werkspoor Diesel 12 TM 410 Medium Speed Engines. 12,000 bhp 15 knots. 1981: Sold Hae Yung Shipping Co. Ltd. South Korean flag, renamed HAEYUNG EASTERN. 1986: August. Broken up at Busan, Korea. 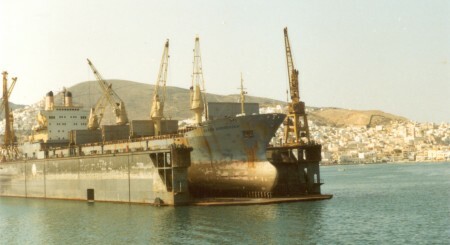 Photo taken by I. Warner at the Neorion Drydock, Syros, Greece, May 1979.